At the end of your turn, give another random friendly minion +1 Attack. He's currently trying to craft a "flail-axe", but all the other swordsmiths say it can't be done. 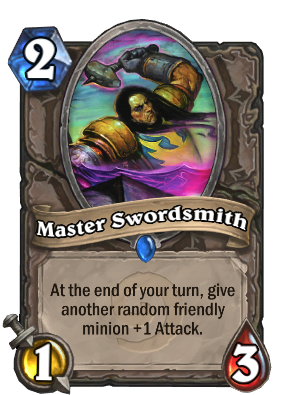 A good 2, especially if you can keep him behind taunts for a few turns. Good for zoo.